Just like the winds of spring, there are new shows that blow into Branson. 2019 joins decades of that windy tradition. Two specific shows are sure to excite and thrill family audiences: SHREK the Musical and Mansion of Dreams with Rick Thomas. Hitting the big stage at the Welk Theater this summer is “SHREK the MUSICAL.” Running only from June 8 to August 10, an original musical based on the Broadway show and starring everyone’s favorite ogre; this once-upon-a-time tale is filled with hilarious, great music, and a talented cast that all ages will find is the perfect family event. Don’t be afraid if he looks odd and possibly smells like some of your relatives while you’re on vacation attempting to escape, Shrek is the lovable, fairy tale ogre surrounded with outlandish characters that keep the story moving. From catchy songs to big laughs and situations, SHREK the MUSICAL brings to life this fantastic fable that will keep the kids enthralled and parents satisfied with time well spent. With this production expected to be such a hit, grab your seats soon for the best view of these virtuosos as they bring to life this famous, family fable. Save $5 off adult tickets and save almost $40 with a family pass for two adults and two kids under 18 at Branson Ticket Deals! Although Rick Thomas has been in Branson a few years, for 2019 he has created a new and one of the largest magic shows in the world: The Mansion of Dreams! Never before has such impressive and an astounding illusionist graced the stage with one of the finest theaters in town. The Andy Performing Arts Center hosts this massive production of astonishing thrills that will leave you dumbfounded and in awe. Don’t just take our word for how grand this production is. 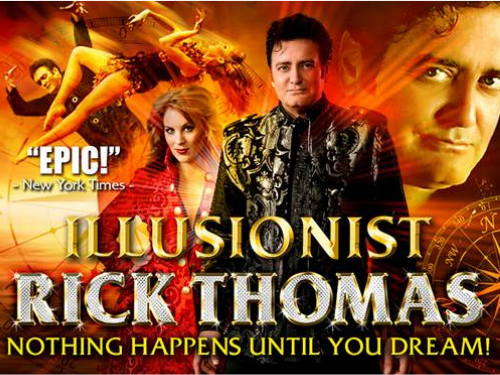 Rick has travelled the world to outstanding reviews from many major productions and was awarded the Illusionist of the World at the World Magic Awards. Purchase through Branson Ticket Deals and see for yourself with $10 off per adult! Now, you’re wondering what other new shows and attractions are landing in Branson. Here is what you can look forward to this year! Area 51 3/4 audience immersion Comedy Dinner; Justin Bieber, Lady Gaga, Taylor Swift Tribute; out of retirement is LeRoy News’s Marty Robbins Tribute; Adele & Joe Cocker Tribute; another murder mystery; Aretha Franklin Tribute; an after-hours Improv Show; and back for one day a week in November and December is Cassandra. Don’t forget the old/new attraction The Shepherd of the Hills that has the outdoor drama in the summer and lots of daytime activities that now include a rope course, 8-line zip, and even ATV rides. There are a few things that were new last year, of which you might not be aware including Nathan Carter of Ireland, Parrotville – Jimmy Buffet Tribute, the Jet Boats, and the Runaway Mountain Coaster. Theses shows and attractions in Branson are almost like the weather – just wait a bit and things will change. Check in with us for the latest news and one-night concerts for stories that will be scattered throughout the season like spring flowers in April. Visit Branson Ticket Deals website for more show information.